I thought I would do a post on the preparation of the binder, or medium, that I am currently using for my paintings on vellum: glair. I am also thinking of it because today I had a magical visit to the rare books library at Dartmouth College, where I pored over some medieval manuscripts, which I'll share soon. According to Daniel V. Thompson, in his book The Materials and Techniques of Medieval Painting, glair was one of the main binders used to make paint––when added to pigment––for manuscripts. Another important binder was gum arabic, used mainly after the 14th century; it is now used to make watercolor paints. The first step in making glair is to separate the yolk and the white, since you use just the white. 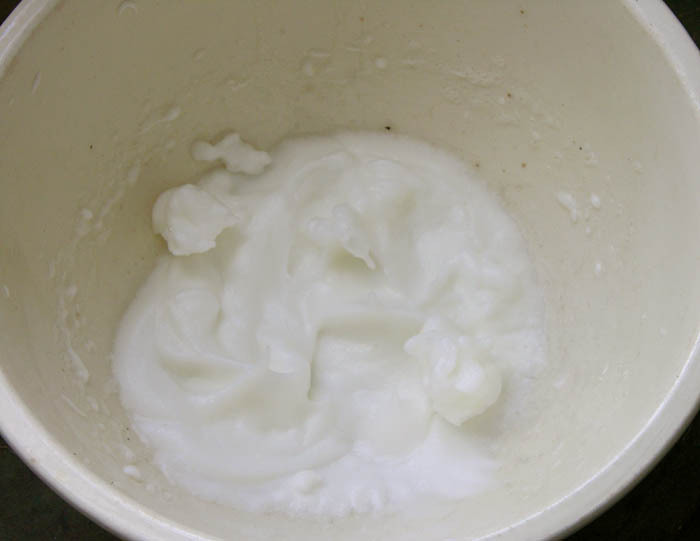 Put the egg white in a non-reactive bowl and beat it until it has stiff peaks. I use a hand held electric mixer, which makes the job a lot easier. 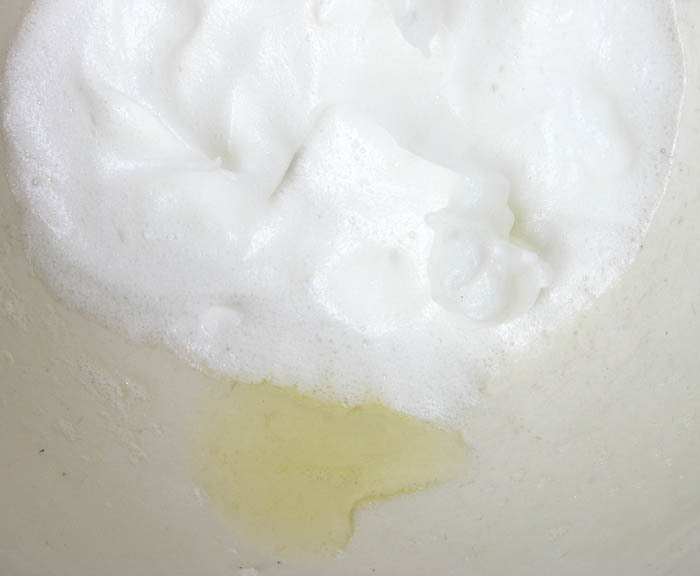 After 3 or 4 hours, tilt the bowl and a clear yellowish liquid will creep out from under the white froth; this is the glair. Every hour or two tilt the bowl again to draw off the liquid; this process can go on for the entire day. Finally, there is no liquid left and the froth that remains is dry and stiff. I get about a tablespoon of glair from a large fresh egg; it doesn't sound like a lot, but because I'm doing such small paintings, it is enough for 2 or 3. It keeps quite well for several days in the refrigerator, a week or more. I like this medium for a couple of reasons: primarily because it yields very rich color, but also because I'm using a local ingredient: eggs from 'Alex's Birdberries', close by in New Hampshire. interesting stuff. isn't everyone thinking of meringue? (I'M surprised you don't raise egg-makers yourself). so the glair must keep for awhile - refrigerated. what stage does that rotten egg smell occur...& do tempera painting ever smell? Your question on keeping the glair made me go back and edit the post, adding that it keeps for several days in the fridge. I notice that it keeps better than the yolk, which has an off smell after 3 or 4 days. There was a nickname for tempera painting in medieval Italy: "arte putrido" for the smelly eggs, but the painting itself never smells. Oh, no chickens for me, thank you; I have enough work around here as it is. Altoon, thank you for showing glair and describing how it's done in more detail. For egg yolk medium I like to use ice around my medium jar as I work, which helps avoid odor. Mona, that's a helpful hint, especially for summer temperatures. I don't like to keep the egg medium too long, though, thinking it may lose its effectiveness if it's old. Thanks for this fascinating tidbit. And yes, I was thinking meringue! you often share like here in this post Altoon. One is so much less scared to try when given such accessible accounts of experiences and small hints... the thingsthe boks may leave out and at a class you cant go back and check! I did think you were cooking up a lemon meringue pie at first! Do you then use this concoction like any medium? Or do you add dry pigment to it? Or do you use tubed tempera? Sorry I am not familiar with this, but very curious. Leslie, I use glair with powdered pigments that I have previously ground with water; the two together, pigment and medium, make paint. To see more about the egg tempera technique you can go to the link to my egg tempera book The Luminous Brush on the top right of the page (though in the book I use egg yolk, not glair).